Living LIGO: Q: If Light is Stretched/Compressed by a GW, Why Use Light Inside LIGO? Q: If Light is Stretched/Compressed by a GW, Why Use Light Inside LIGO? Wow! It's been a while since I've posted... After the start of a new semester (I have 150 students in the class I am teaching at LSU) and Hurricane Isaac (which shut LIGO Livingston down for almost a week, LSU for 3 days, and left me without power for a while), I am just getting my life back to a somewhat normal routine. I love even the hectic parts of my life, but I've missed writing about gravitational waves here on Living LIGO! Q: IF LIGHT IS STRETCHED/COMPRESSED BY A GRAVITATIONAL WAVE, WHY USE LIGHT INSIDE LIGO? Today I am addressing a question that many professional physicists fully don't understand! I wrote a little while ago about how light and gravitational waves will stretch out as the Universe expands (this is called redshift). If an object is coming towards us, its light is compressed (and this is called blueshift). Basically, if objects are moving, light and gravitational waves will experience a Doppler effect. I have also written about how a passing gravitational wave will stretch and compress space in perpendicular directions. When you put these two facts together, you come to the conclusion that the light inside the arms of LIGO is also be stretched and compressed by a gravitational wave. So, how can we use this light to measure gravitational waves when the light itself is affected by the gravitational wave? A passing gravitational wave will expand and compress space-time and the wavelength of the light we are using to measure gravitational waves is itself affected by the gravitational wave. Since LIGO and detectors like it effectively measure the length of its arms and compares them to each other, how can we rely on light to measure any length changes from a passing gravitational wave? The solution begins to become clear when you start thinking of the laser light as a clock instead of a ruler. When the light comes out of the laser, there is a fixed time between each crest of the wave (this is called the period of the wave). Let's label each crest as 'tick' (like a clock). Our laser (labeled 'Laser' in the image below) is very stable in that it produces a very consistent wavelength of 1064 nm (near-infrared light). Because the speed of light is constant no matter how you measure it, that means that there are almost 282 trillion (2.817 x 1014) 'ticks' every second. This light is then split into two equal parts (at the 'Beam Splitter' in the image below), one for each arm. Basic diagram of the LIGO detectors. Since different things can happen to the light once it is in the arms, let's reference the beam splitter for making length measurements (i.e., let the beam splitter stay in the same place while the gravitational wave alternates squishing and stretching the arms). A real gravitational wave will cause one arm to shorten and the other to lengthen. This will also cause the laser wavelength in the shortened arm to decrease (blueshift) and the wavelength in the lengthened arm to increase (redshift). But there is nothing in the detector that measures wavelength. What it really measures is the shift in the arrival time of each 'tick' of the wavelength crests. If the arms stay the same length (no gravitational wave), then the 'ticks' of the laser light come back to the beam splitter at the same time and produces destructive interference where we measure the light (labeled 'Photodetector' in the image above). If a gravitational wave causes the length of the arms to change and shifts where the 'ticks' of the laser light occur, the two light beams will no longer return to the beam splitter at the same time. It is this "out of sync" arrival time of the crests of the laser light that produces the interference patter we utilize to detect gravitational waves - we couldn't care less about the actual wavelength of the light (other than it was consistent going into the detector). A wonderful, concise summary on why light can be used in gravitational wave detectors like LIGO has been published in American Scientist here. The author, Peter Shawhan, is an associate professor at the University of Maryland, College Park. There is also an article in the American Journal of Physics (vol. 65, issue 6, pp. 501-505) titled "If light waves are stretched by gravitational waves, how can we use light as a ruler to detect gravitational waves?" This is a more technical article by Peter Saulson who is a professor at Syracuse University. David Garfinkle also has a discussion of this topic. Thanks! This is a great article. BTW, would you be interested in doing a guest post on quantum gravity? I am sure that my readers would be interested in your work and its implications! Interesting question! I guess this only works if the gravitational wave frequency period is much more than the time it takes the laser to do a round trip? Actually, both are important. In order to get the maximum affect of a gravitational wave on our detector, the light should be in the arms for 1/2 of the period of the gravitational wave. 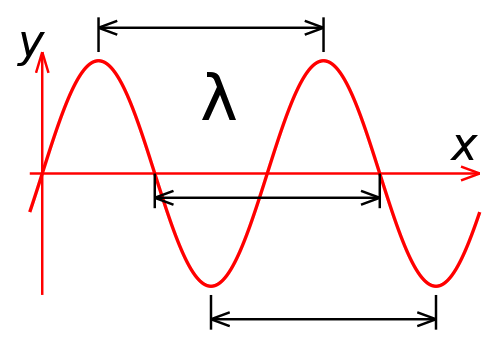 Anything less and we haven't added up all of the affect we could and any more and we are starting to cancel out the effect we've already gained (this is like adding up the area under a [sine] wave: the first part of the wave you are adding and the second part you subtract). The 4 km (~2.5 mi) long arms of LIGO are too short to really capture the half period we'd like, so we make the light bounce back and forth in the arms in a resonant cavity (Fabry-Perot) so that the GW has longer to act on it. Bottom line, LIGO works best when the laser round trip time is 1/2 the gravitational wave period. I really can't get my head around this question and the explanation above... If space is stretched in one direction when a GW passes through it, isn't time affected as well? If so, wouldn't the time dilation compensate for the change in distance resulting in exactly the same travel time as if it wasn't stretched at all? I would appreciate any pointers that would help me understand this! I have a question somewhat related to the one from Science and Religion: when the arm is stretched, won't a crest in the wave be carried forward as well, essentially negating any increase in the length of the arm as it relates to the time of arrival of the crest at the mirror at the end of the arm? 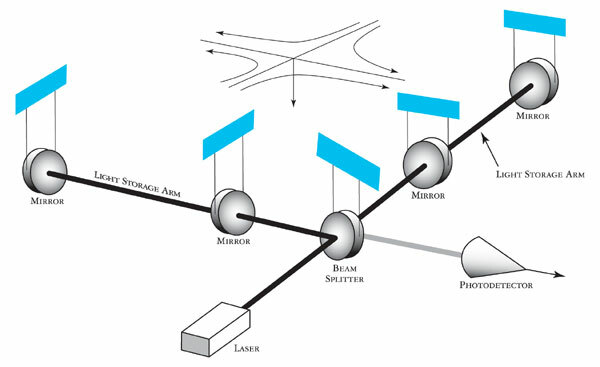 Each arm of the interferometer contains freely-moving test masses (mirrors). Consider the test masses to be fixed with respect to coordinates (called TT coordinates). Weak gravitational field is equivalent to a refractive medium. Gravitational wave changes periodically refractive index of the medium, thus, changing wavelength of light used for measuring the constant length of the arms in the TT coordinates. 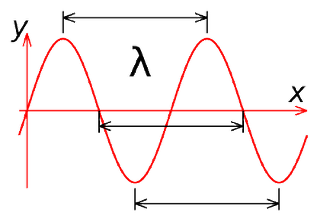 Thus, as time goes on a different number of wavelengths of light fits in the constant length of the arms. The number of wavelengths of light is different for the perpendicular arms. This produces the interference patter which we measure. This explanation is given in TT coordinates. More naturally, is to think that the arms themselves change their length. This is also true but in a different (local inertial) coordinates which do not belong to the class of TT coordinates. The answers given above my comment are given in the local inertial coordinates of observer.